Are you a decision-maker in your church? Fill out the brief form below and we'll get right back with you to give you an in-depth, behind-the-scenes look at a no cost way to identify, connect and equip your churches marketplace leaders for Kingdom Ministry. For over 25 years Christians In Business has been helping churches form a partnership with business leaders that goes beyond Marketplace Ministry. Producing a beautiful full-color church business directory at no cost to your church not only meets the needs of your members, but creates a lasting bond with your business leaders proving that you are interested in their success. This is the first step in building or strengthening this demographic within your church, and the benefits will astound you! 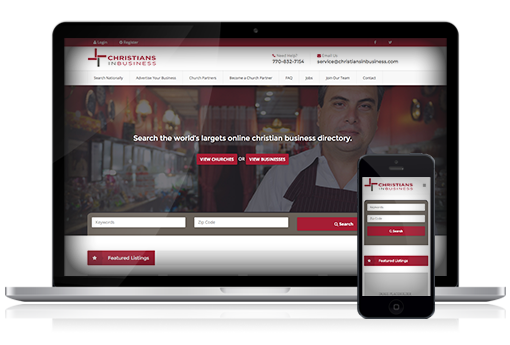 CHRISTIANSINBUSINESS.COM will not only host your FREE online church business directory, but it will also give you an immediate communications portal to stay in touch and encourage your business leaders. An exclusive, built-in, employment section helps connect those who need employment with those businesses who need good employees. This is another way to strengthen your church since employed people have more resources to share. Christians In Business Roundtable Groups (CIBRG.com) is a structured and proven model to help business leaders improve their leadership skills and their revenue producing abilities which increases their giving potential. By sharing the best practices of today’s leading companies, and through goal-setting and accountability, we are helping build companies with an eternal perspective.